This Zeiss FF 1 Precision Alignment Telescope is the most accurate alignment telescope that I have ever found....able to resolve 1 micron in both the X and Y axes. Extremely rare, as only large companies and government agencies were able to afford the $100,000+ price when it was new. 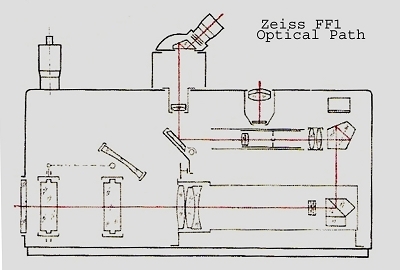 Zeiss utilized a unique optical design in which the operator looks through the eyepiece and will see two images of what is focused upon, then by manipulating the X and Y micrometer actutors and bringing the view to a single image, one can directly read the micrometers and readouts to determine how far out of alignment the object under observation is.... 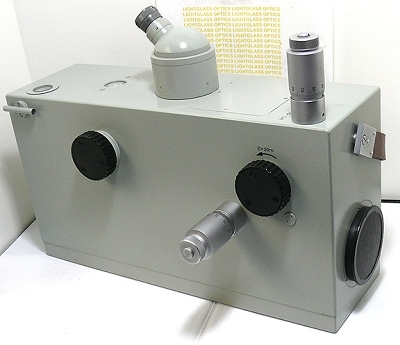 There is no illuminator port, so this is not an autocollimating unit.